Tourism to South Bohemia tends mostly to go to the UNESCO world heritage site of Český Krumlov. This is understandable, because Český Krumlov is a beautiful medieval city. Sadly most international visitors arrive and depart via bus tour and miss the best time if not some of the best parts of the city. 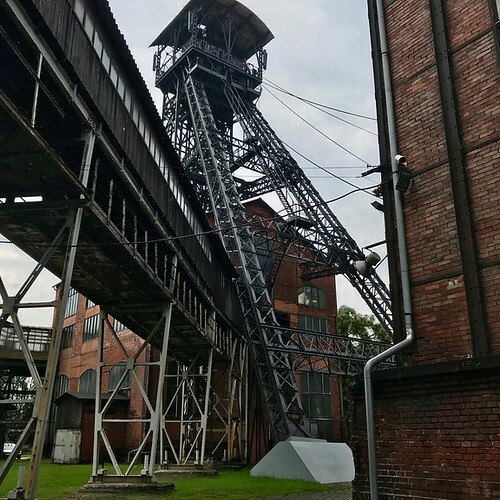 They also miss other great sites in South Bohemia including its other UNESCO site. Český Krumlov is built on a series of S shaped curves in the Vltava River and is crowned by its castle. 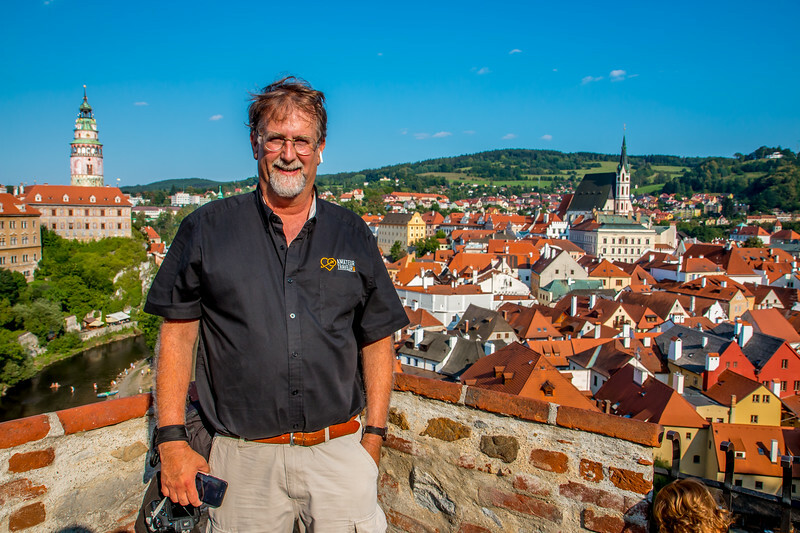 The first thing that draws your eye about Český Krumlov is the tower from the old castle. It is a round tower painted more like an art project than a means of defense. Visiting the castle of Český Krumlov is nearly mandatory. It is the most notable feature of the town. The castle is not one castle but two. It may be hard for Americans, like me, to understand the complexity of history in the region which for many centuries was more about inherited pieces of land than countries as we currently think of them. This region of what was more widely known as Bavaria was part of the multi-ethnic mishmash of tiny states known as the Holy Roman Empire (1198-1806), but was also part of the Kingdom of Bohemia (1348–1918), and evolving Austria (with the Hapsburg Monarchy (1526–1804), the Austrian Empire (1804–67), Austria-Hungary (1867–1918)). The fact that those dates overlap in weird ways should give you some idea of the complexity of Europe before around 1871 when national boundaries finally coalesce with the creation of Germany as a country. Because of that the history of cities like Český Krumlov centers around which noble family was in charge at any one time. The tower that captures our attention when we see the town is one of the oldest parts of the city. The Bohemian noble family Vítkovci built a castle on this spot in 1240. The tower and the Little Castle at its base are all that are left of that structure. Soon after the construction of the castle the town started to come into existence as this site was at a ford on the river Vltava on an important trade route. The Renaissance facade on the Little Castle was added later. 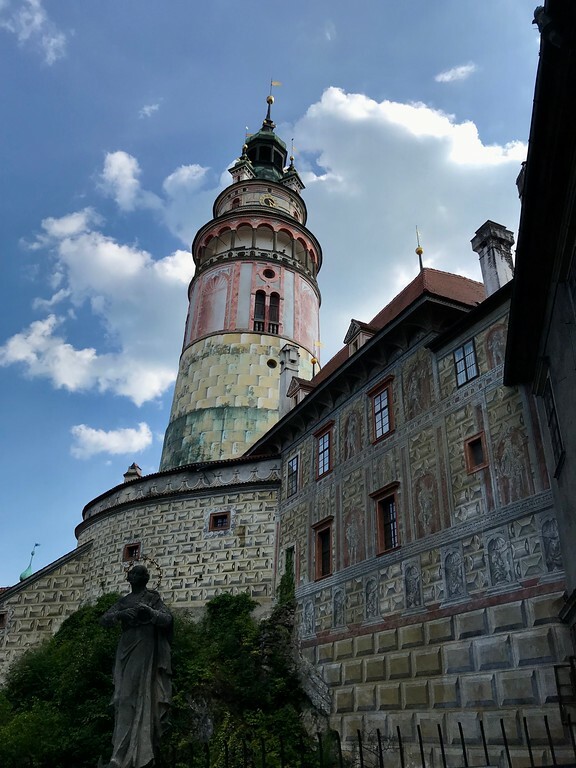 You can tour the tower (and attached museum) which Czech writer Karel Čapek called “the towerest of all towers” for 180 CZK ($8) for an individual and 270 CZK for a family. The cost for a guided tour is an additional 100 CZK. The walk to the top of the tower takes 162 steps but offers a great view. When the Vítkovci family died out the castle and town were given by King Wenceslaus II (no not the one from the Christmas song) to the Rosenberg family. The current castle was built by the Rosenbergs who did much to expand trade in the city. It did not hurt that gold was discovered nearby. German miners came to mine the gold, in what was already a predominantly German speaking region. The castle built by the Rosenbergs is more impressive on the interior. 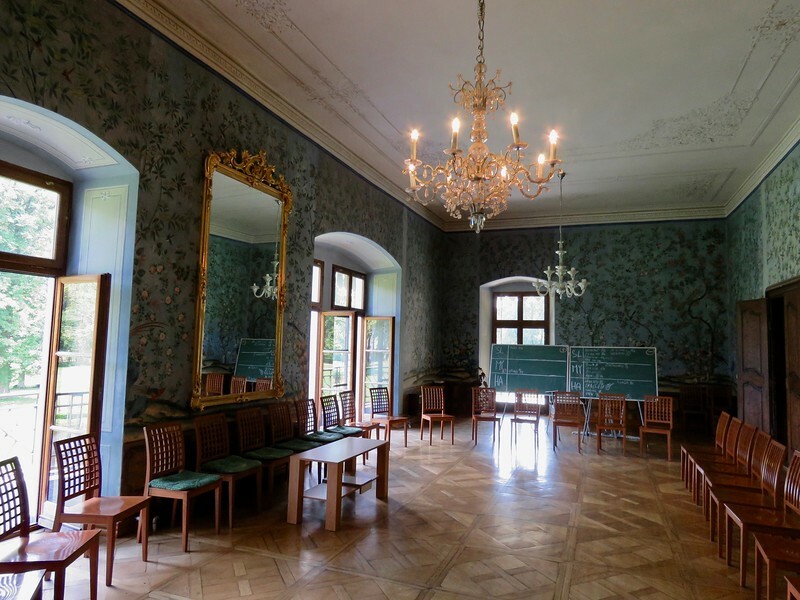 You can tour the castle on a number of different guided tours starting at 240 CZK for foreign language tours. Tours in Czech are cheaper. 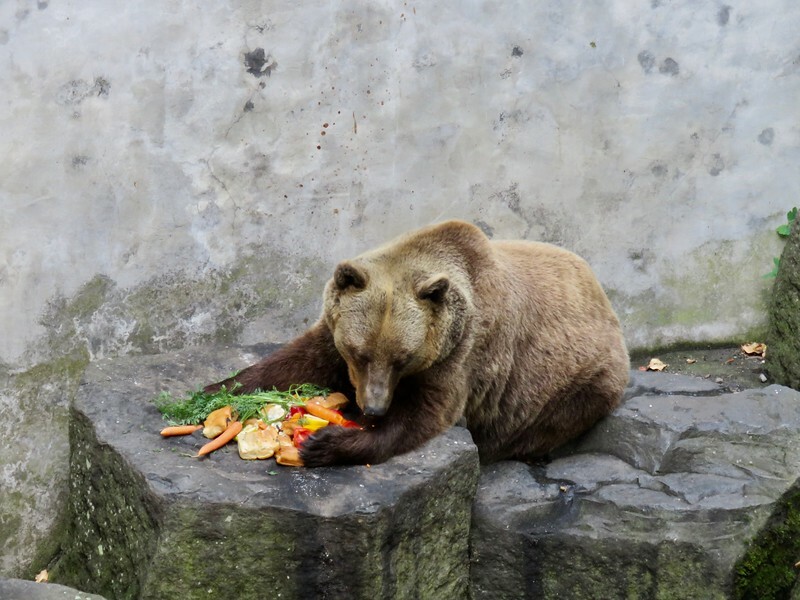 Since the last of the Rosenbergs there have been bears kept at the castle. These days you can find them in the moat at the gateway to the castle. The Rosenbergs sold Krumlov to the house of Hapsburg but after a brief ownership they gave it to the Eggenberg family. The Eggenbergs became nobility through Ruprecht von Eggenberg who served the future Holy Roman Emperor Ferdinand II at the battle of White Mountain in the 30 years war. In that battle, Ferdinand defeated the protestant army with the result that Bohemia returned to the catholic faith for the next 300 years. In the Eggenberg Hall in the castle, you can see the Golden Carriage that Ruprecht von Eggenberg used to make his second of two visits on behalf of the new emperor to the pope. The last family to rule in Český Krumlov was the Schwarzenbergs who ruled until the communists took charge in what was by then Czechoslovakia. They were given Český Krumlov when the Eggenbergs died out. The Schwarzenbergs were both Czech and German nobility. 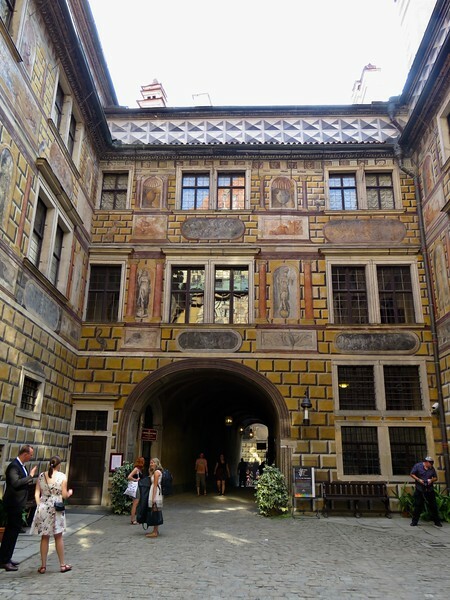 They again contributed to the prosperity of the region including the construction in the late 1700s of the Schwarzenberg navigational canal which connected the Vltava river with the Dunaj river. This canal helped the economics of the forestry industry in South Bohemia. 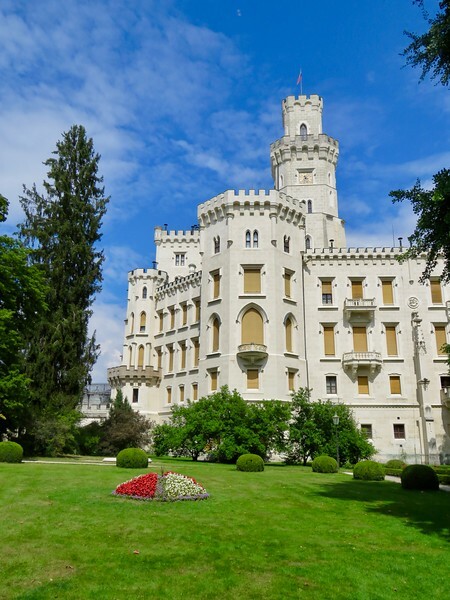 As the last owners it is the Schwarzenberg’s version of the castle that we see today. The top floor of the castle was constructed by them as well as the Masquerade Hall and Mirror Hall. They also reconstructed the St. George’s Castle Chapel and the theatre that the Eggenbergs had built. The family stopped using the castle as their primary residence in the mid 1800s. In addition to visiting the castle take some time to explore the town of Český Krumlov. not only is it picturesque in itself, but you can also get some of the best views of the castle from the lower town. It is an easy walk from the Red Gate down into the lower town. There are lots of shops and restaurants. 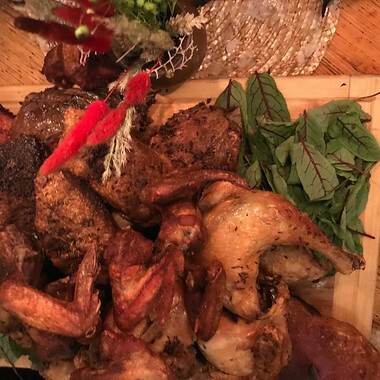 We had a medieval style (except without all the plague) feast at Krčma Šatlava near the town square. Not a great spot for vegetarians, but great for carnivores like me. Český Krumlov also gets a lot of Czech tourists, but many of them are having a very different experience. 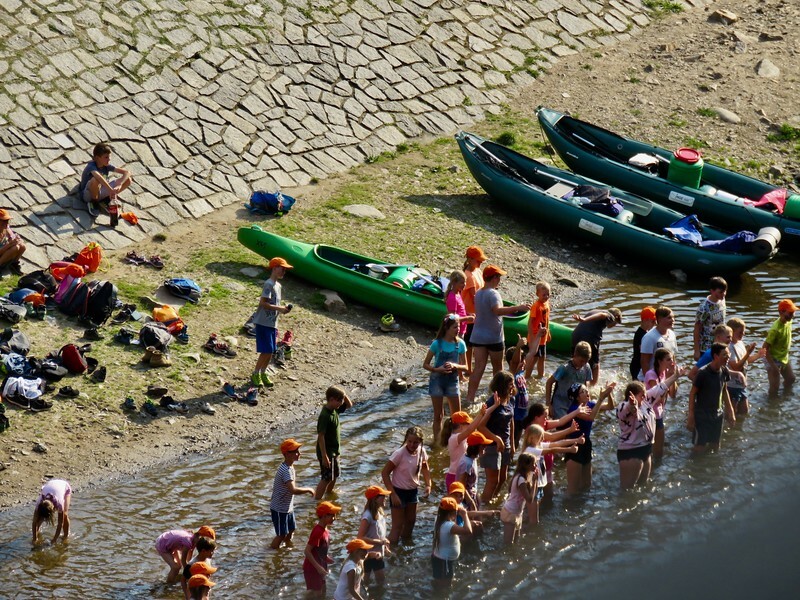 We watched from the castle as large groups of locals kept arriving into the town by rafting or canoeing down the Vltava River. A lot of the groups camp just upstream out of town. Outfitters will drop off the groups further up the river to the town of Vyšší Brod and then pick them up again in the city. 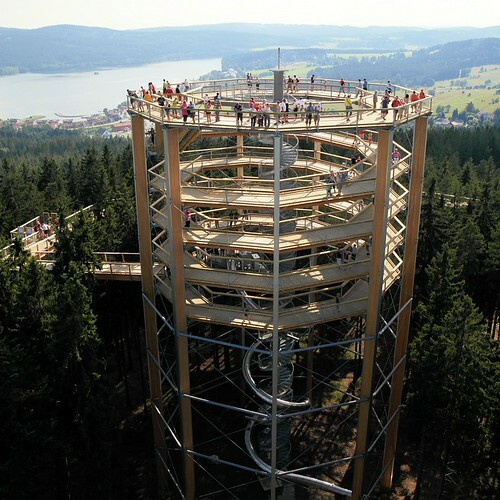 See “10 Outdoor Activities in South Bohemia, Czech Republic” for more activities. 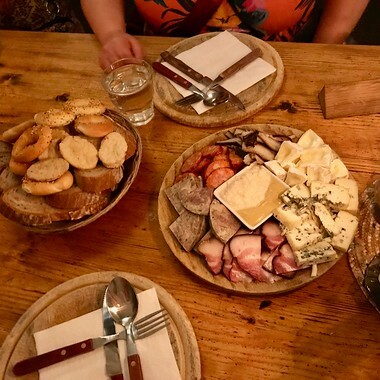 We happened to visit Český Krumlov during the 22nd year of its International Music Festival. The festival runs annually in late July to early September. 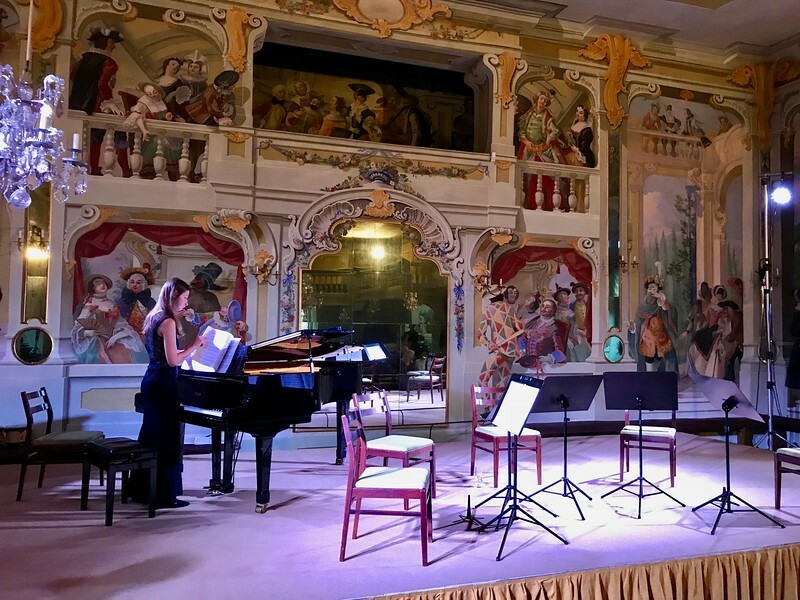 This year they had 22 different performances including a classical chamber music concert that we attended in the Castle’s Masquerade Hall. The hall is filled with colorful spectators painted in large murals on the walls. The festival also takes place in the castle gardens and other theaters. It features a wide variety of music which this year included: an opera gala concert, symphony and chamber concerts, an organ concert, swing music, a musical and folk music. Český Krumlov is one of two UNESCO sites in South Bohemia. The second is the village of Holašovice which is on a much more modest scale. It is a village of only 23 farmyards in the style of Bohemian Baroque. Each farmyard has a house, barn, and other out buildings in a U shape facing a central village green. When German speaking residence were told to leave South Bohemia at the end of WWII, this area as well as Český Krumlov remained under populated for years which helped preserve them. If you like Holašovice there are numerous other villages in this style in the area, notably Plástovice, Malé Chrášťany, Horní Chrášťany which have similar architecture but have not been designated by UNESCO. If you are interested in seeing other palaces or manor houses of the rich, famous and Czech in the area there are 3 that I can recommend. The Schwarzenbergs built this castle at the beginning of the 1700s and lived here at least part time until WWII when it was seized by the Gestapo. It is a beautiful castle in the romantic style, possibly the most beautiful castle in the Czech Republic. By comparison Castle Mitrowicz near České Budějovice is a more modest manor. The difference is that you can stay in this newly remodeled estate. If you are planning a destination wedding for South Bohemia, this is where you want to have it. It includes a chapel which the bridal suite overlooks. The most unusual castle we visited in the area was Červený Dvůr which is only 8km from Český Krumlov. The Eggenbergs established a hunting reserve and garden here in 1598 and the Schwarzenbergs built the castle in 1672. It is a palatial estate that still has 290 acres of english gardens. You can also stay in this palace, but you may not want to as it has become a psychiatric hospital. It specializes in alcoholism therapy and drugs dependence, but if they ever start a treatment program for addiction to blogging and podcasting then this is where I would want to be treated. The palace does have some access to the public, but it would be best to ask before visiting. 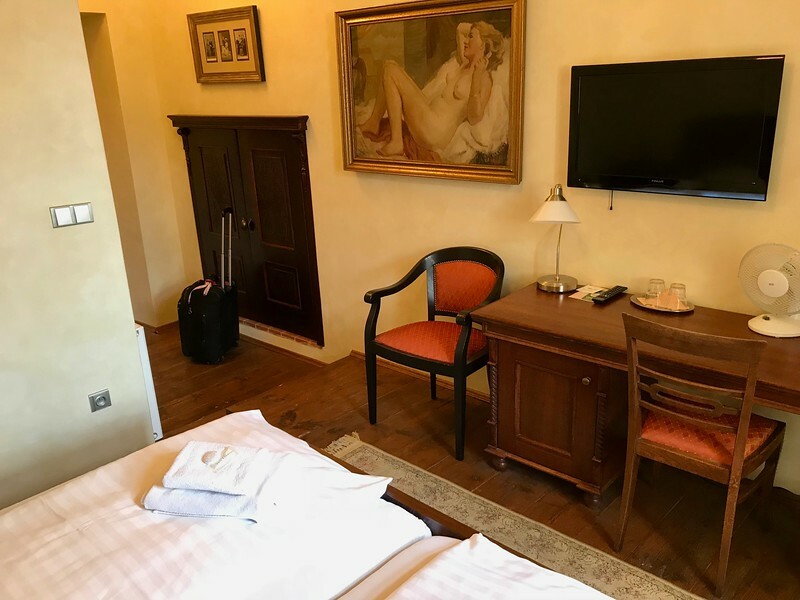 In addition to staying the night at Castle Mitrowicz, we also stayed at the Hotel Latrán which is in the historic city center right near the Red Gate to the castle in the upper town. You can’t get any more convenient that this. The best time of day to see Česky Krumlov in the summer is after 5:00pm and before 10:00am when all those visiting the town on a bus tour are gone. It stays light much later so you can take a leisurely stroll through the town, attend a concert, or try out a local restaurant. During the day, to avoid the crowds you can take a raft or explore the countryside of South Bohemia at some of the sites mentioned above. 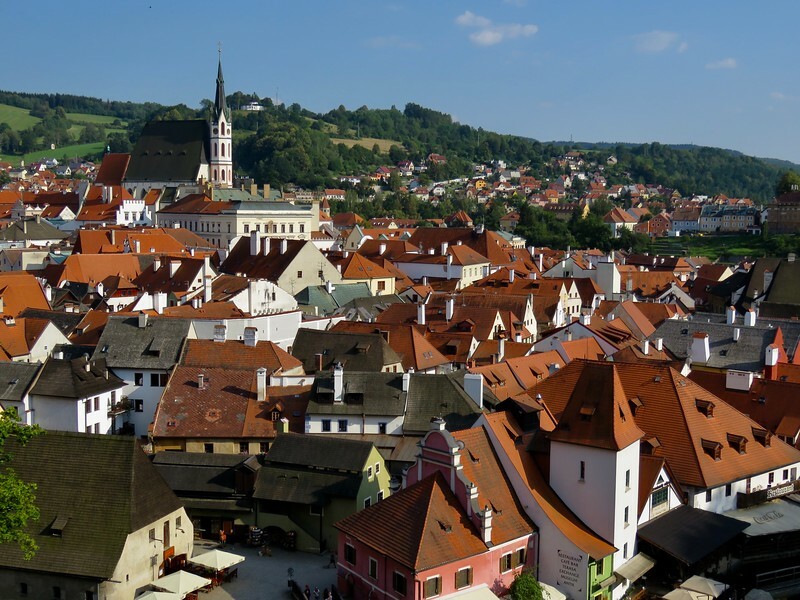 However you see Česky Krumlov, it is a must see destination… but linger a bit and you may enjoy it even more. It was a great pleasure to meet you in Czech Republic last month. All the best for you and Amateur Traveler, and hope to see you somewhere out there soon.